Just for fun The story about an accidental revolution. 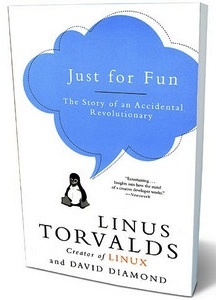 The Linus Torvalds biography. A real computer geek just has to read all about the live of one of the inventors of Linux. So if you are geeky and have nothing to read just go check out The Linus Torvalds Biography. Who wants to learn databases the boring way? I know I prefere a more fun way and I think I found it with the Manga Guide to Databases. Now you can learn from Tico the fairy all about database and how to manage you data. It even teaches you basic SQL statements and has some exercises for you to. You can all read about how Princess Ruruna learns all this and more and how she organizes her kingdom in a timely matter. Go check out this Manga Guide and learn all about Databases. So you are dating a geek? And now you wonder how to deal with this. Let me help you, this book will tell you what you need to know about geeks. It even has a geek test to see where your geek stands on the geek ladder. But don’t worry dating a geek is at least as exciting as dating a guy from the sporting team but then just a little bit different. Go check out A Girl’s guide to dating a Geek and read it for yourself.